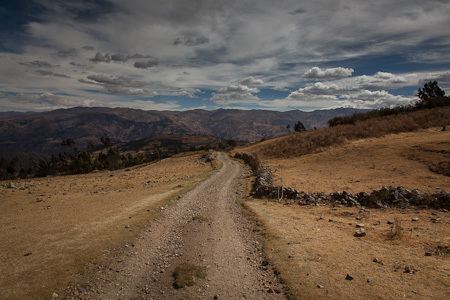 Having ridden all the way up to Shirapucro to visit Ben and his bici cooperativa, it seemed to shame not to put all that effort to good use – and delve just a little further. The world is my oyster. 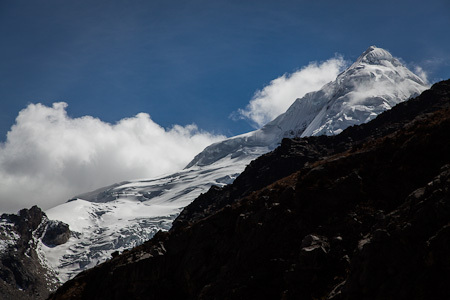 Or at least, a little slice of the Cordillera Blanca is. 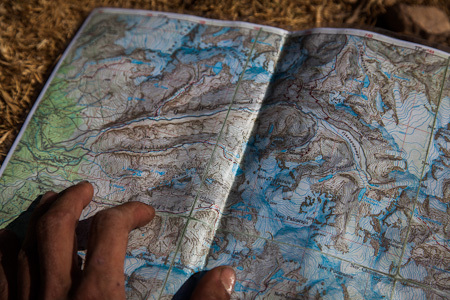 I’m very pleased with my photocopied and laminated 1:100 000 topo – it covers all the quebradas within striking range of Huaraz. Overnight bikepacking galore. 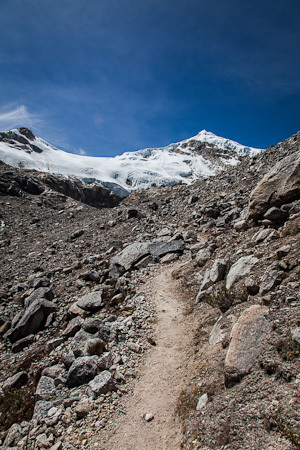 Heading up, up and up towards Quebrada Ishinca. 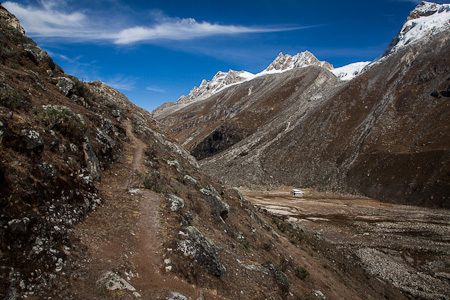 After a hefty climb, our dirt road dead-ends at a windswept football pitch, from where the trail narrows down in width. Dreamy riding conditions, give or take the odd push. Our picnic spot. A perfect spot for contemplating the ills of the world, and how they might be alleviated by the simple act of pedalling. 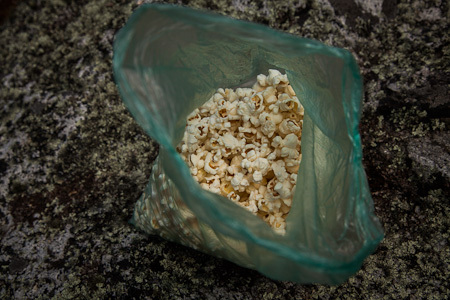 Case in point: popcorn, apples, bananas and sweet bread keep our legs turning. 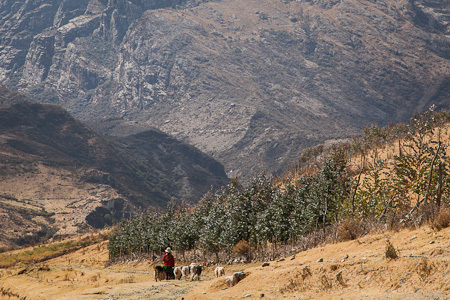 Before long, the trail wends its way through a thicket of Quenoal Forest – a tree found only in the high Andes, between 3500-5000m. 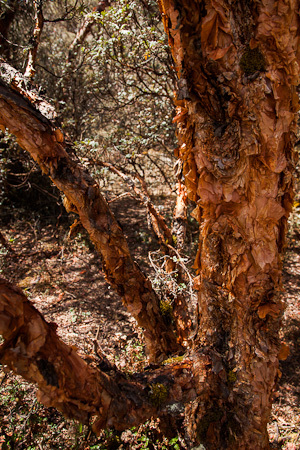 It’s a tree known for its gnarled, contorted branches, as well as its distinctive texture. Hence the Latin name. Polylepis: poly – many – letis – layers. It’s this layering effect that helps protect it from low temperatures. Yum. 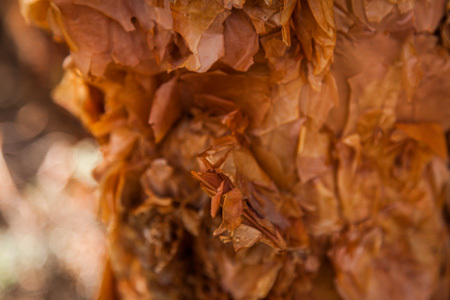 The delicate, paper-thin bark reminds me of mille-feuille pastry found in French patisseries. I pitch my tent up on the pampas at 4350m, bidding farewell to Ben, who soaks up the view, before turning round and heading for home. More lung friendly, clean air, as evident by all the lichen splatters on the rocks. Who says denatured alcohol doesn’t work at altitude? Ok, so it’s a little slow, but it gets the job done. Quick message to mum and dad. I’m alive! 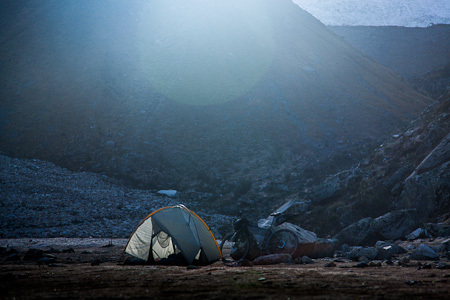 As the first beams of sunshine reach me, feeding warmth into my body, I creep out of my Tarptent. My camping neighbours are three Sheffielders – Ben, Neil and Owen – here to bag some peaks. I join them on the hike up to Laguna Ishinku, lying en route to Ranrapalcu, which Ben and Owen intend to climb. There she be: Ranrapalca, 6162. 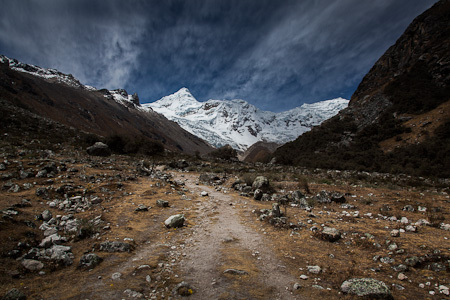 It’s a beautiful trail – easier for me, as I’m only carrying a light pack, rather than trudging round with ropes/ice axes/crampons /heavy boots and all the other mountaineering paraphernalia. 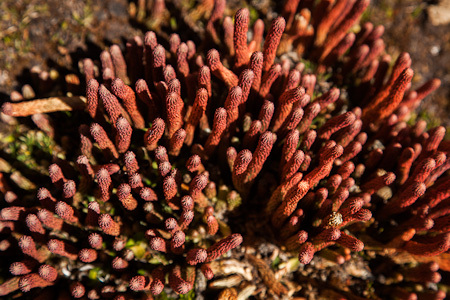 I haven’t seen these fellows, Club Mosses, since the high paramos of Ecuador. 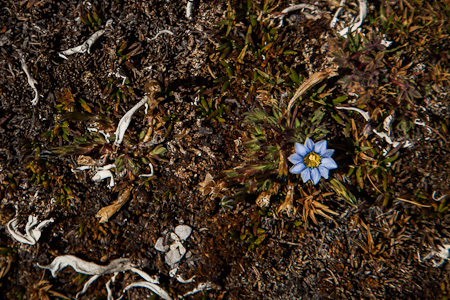 As does this little mountain flower, also found at 4750m. 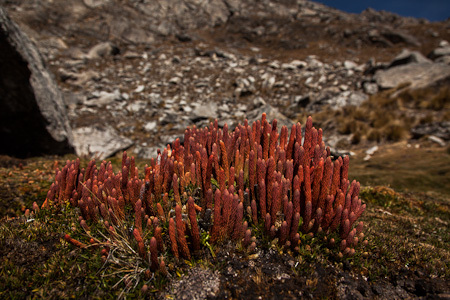 Typically, high altitude flowers are especially colourful, as pollination isn’t always easy to come by. 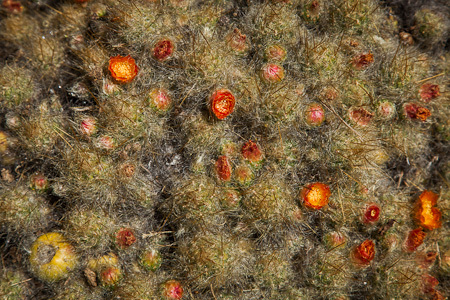 A strange flowering cacti – note its fruit in the far left corner. 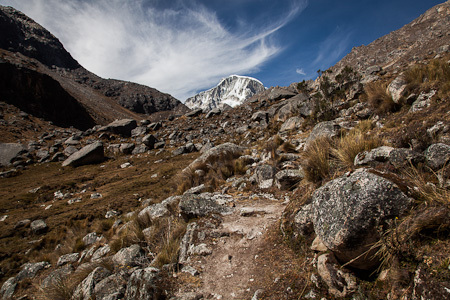 Onwards and upwards: Ishinca peak, 5530m. Laguna Ishinca lies at the foot of Ranrapalca. Here, you can see the channel that helps regulate the water level of the lake – built to avoid a catastrophe like that of Yungay. In 1970, 18,000 people died in a mudslide dislodged by an earthquake. Looking down on Laguna Ishinca, 4950m. Standing at over 5000m, this is the highest I’ve been on the journey. 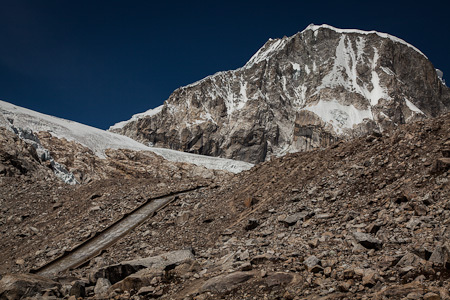 A glacier tongue – the lowest point of the glacier. 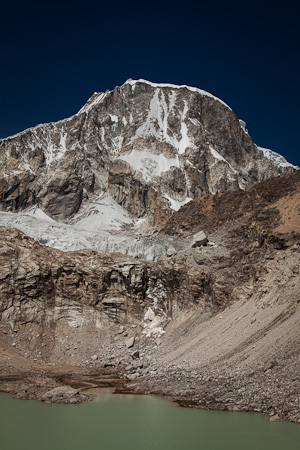 You can just about make out three black dots in the lower, middle part of the picture – climbers descending from Ishinca, the neighbouring peak to Ranrapalca. 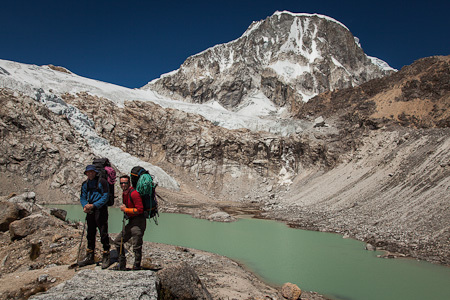 The intrepid climbers prepare to set off for their basecamp, on the other side of the lake. Neil and I bid them farewell – we’ve arranged to meet up for chocolate mousse at fancy Christoff’s restaurant on their return. 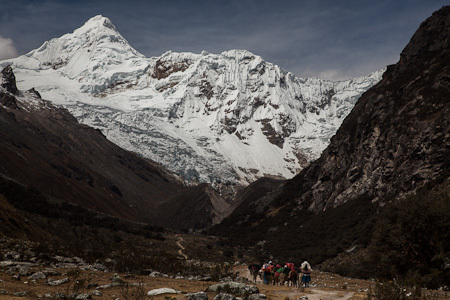 The hike back: Tocllaraju views all the way. Back to our camp spot. 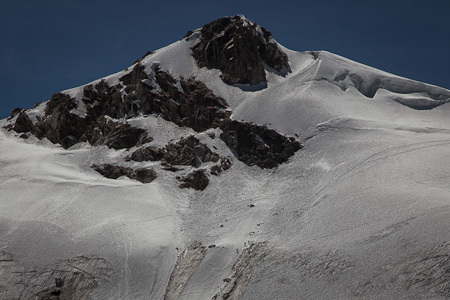 To the left rises Tocllaraju (6032m), etched with seracs – overhanging ice and snow. In the foreground, the massive moraine bank has spilled out all its innards. A bit like a gargantuan, chocolate liqueur. 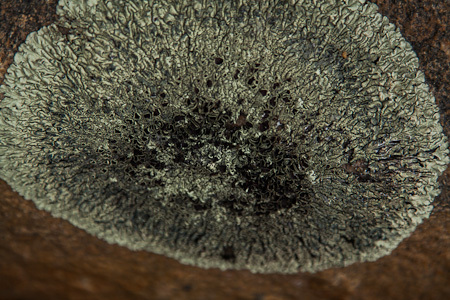 … and fun boulderyness like this. More photos here. 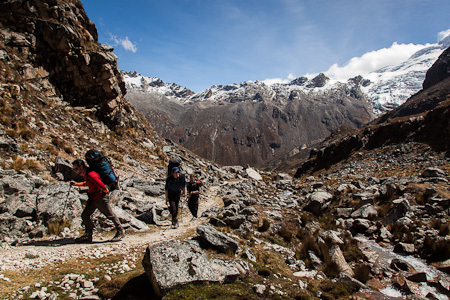 Another climbing group heads for the pampas. Finally, I’m on dirt again, plummeting down towards the valley floor. 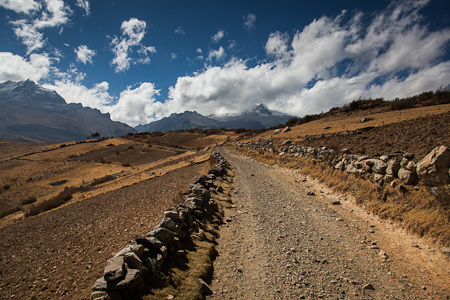 Then, it’s just a short stint on pavement until I’m back in Huaraz. 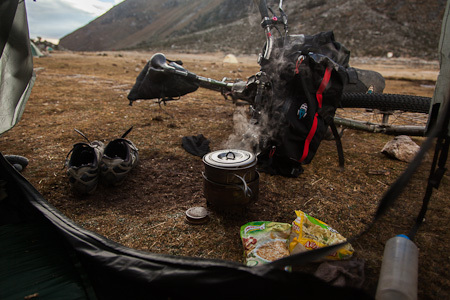 I made a loop, riding out to Tarica, before climbing up to Shirapucro, Pashpa, and into the quebrada. 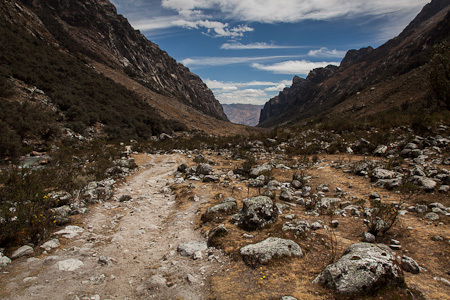 Quebrada Ishinca is one of the more popular gorges in the area, home even to a surprisingly stout and luxurious mountain refuge (30$ for bed and half board). 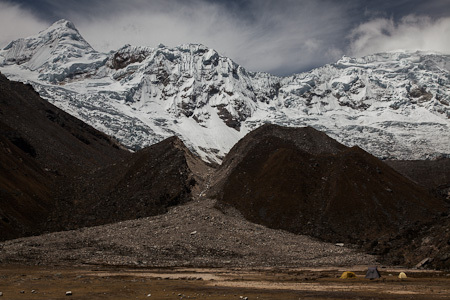 In the midst of the high season, I expect the pampas are awash with the bright colours of mountaineering tents, but at this time of year, things are quieting down. 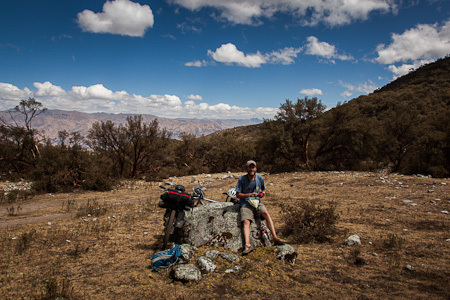 The hike to Laguna Ishinca takes a couple of hours – gaining 650m. It’s speedy on the way down. 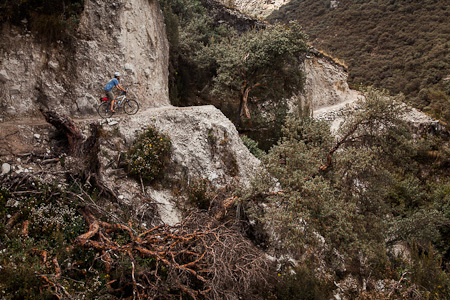 The same can be said for the singletrack descent from the refugio. The first 11kms or so follows a rock-mined trail. 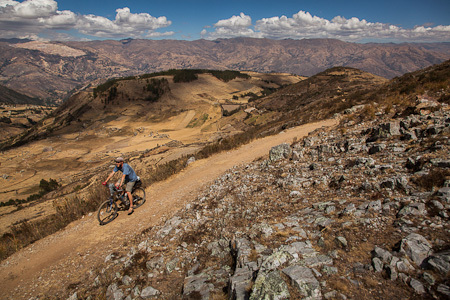 It’s 99 per cent rideable, as long as you’re a confident mountain biker. Then it’s a rough dirt road that whirligigs down, down, down. 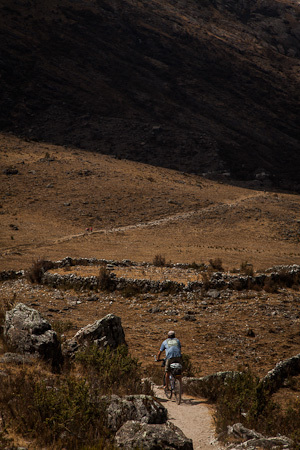 I rode from the refugio to the valley floor in an hour and a half (22km), plus half an hour on pavement to Huaraz. 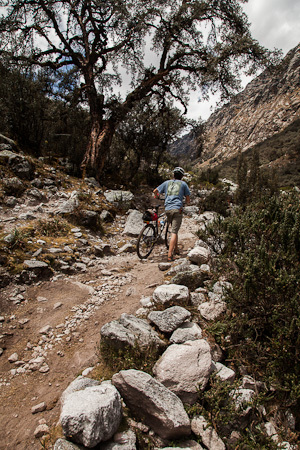 I’d considered hike ‘n biking from the refugio to Quebrada Akillpo – but the ascent looked especially steep and rocky. I was told to allow 4-6 hours; the descent on the other side is said to be a good ‘un. Pincel de Oro, Jr Simon Bolivar n733, behind Gringo Square (6 soles for a large copy, 3 soles for the lamination). 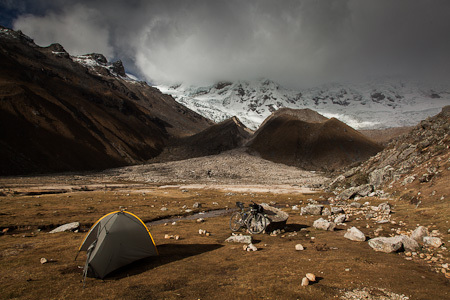 This entry was posted in Bikepacking, Peru and tagged Bikepacking, Cordillera Blanca, mountain biking, porcelain rocket, Quebrada Ishinca, Surly Troll on August 28, 2012 by Cass Gilbert. 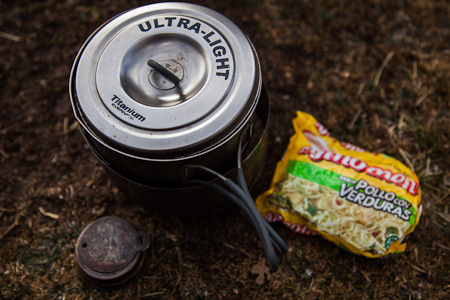 While hiking, where do you secure your Ogre and other gear? 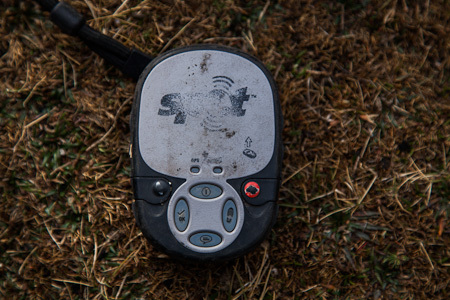 For this hike, I left Ogre in the refugio. I just took my valuable – passport/money etc… At other times, I’ve hidden him amongst boulders. 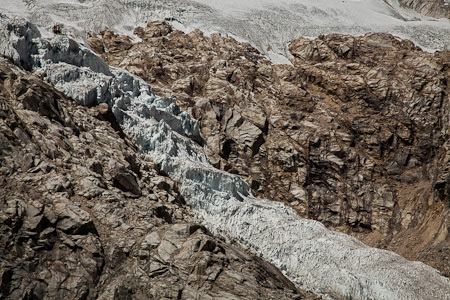 I love the way that scale becomes so hard to distinguish in photos of mountains and glaciers like these! Between you and Joe and Nicholas, NatGeo could publish a special edition.